You'll be £6.80 closer to your next £10.00 credit when you purchase Flight Craft: Hawker Hurricane. What's this? When Sidney Camm's masterpiece, the Hawker Hurricane, entered RAF service in late 1937 it quickly became one of the most important aircraft in Britain's military arsenal, especially in the first three years of the Second World War. This title covers the history of this iconic design, from the prototype and the initial production variants' entry in to RAF service, through its development and use, first as a day fighter, and then night fighter, intruder, fighter-bomber, catapult-launched and then carrier-based fighter, and eventually dedicated ground attack machine. The Hurricane served in every wartime theatre, from Norway and France, the Battle of Britain, the defence of Malta, to the campaigns in the Western Desert and the Mediterranean, on the Russian Front and in the Far East where it saw service until the end of hostilities. 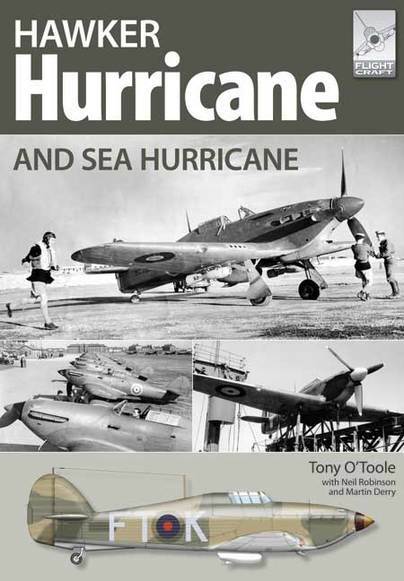 Split into three primary sections, this volume offers a concise yet informative history of the Hurricane's development, operational career and design improvements, including many contemporary photographs with detailed captions; a 16-page colour illustration section featuring 48 separate aircraft (in profiles and 2-views); and finally a section prepared by that well-known and established doyen of model makers, Tony O'Toole, listing and illustrating the plastic model kits produced of the Hurricane in all scales. As with the other books in the Flight Craft series, whilst published primarily with the scale aircraft modeler in mind, it is hoped that those readers who might perhaps describe themselves as 'occasional' modelers – if indeed they model at all – may also find that this colourful and informative work offers something to provoke their interests too. The amount of information packed into the book is surprising and of very high quality. An excellent publication which will satisfy serious model makers, but a first class book for novice of all ages and for those who are enthusiasts of a remarkable aeroplane...This book not only provides a good history section and a review of plastic model kits, but it also describes how kits can be modified into accurate Sea Hurricane models. Many colour profiles of representative aircraft with detailed and comprehensive kit review sections. If you like hurricanes then you will love this book... Well illustrated. Often books on the great classics of aviation risk becoming boring and add little to those already published. This is not the case however for the third title in the 'Flight Craft' series published by Pen & Sword and devoted to the Hawker Hurricane. This is due to the successful combination of a book for modellers as well as historical enthusiasts. If one is considering a series of Hurricane builds, this book is a vital research tool and gives sage advice on where certain kits fall down (and where they excel). Ideal for modellers, these new Flightcraft titles continue to show lots of promise, with well written content, neatly laid out and presented.